That’s why on our California adventure back in June, we attempted to cover a wide variety of wineries and breweries. For us, the two beverages go hand-in-hand, and no better place exemplifies this symbiotic relationship than the wine country of and near Sonoma County. So for this post, we prepared a list of wineries that are definitely worth visiting. And we want to highlight two more impressive breweries: Bear Republic (in downtown Healdsburg), and Anderson Valley Brewing Company (on a stunning drive north to Boonville). Bear Republic offers a classic brewpub food experience with exceptional beer. 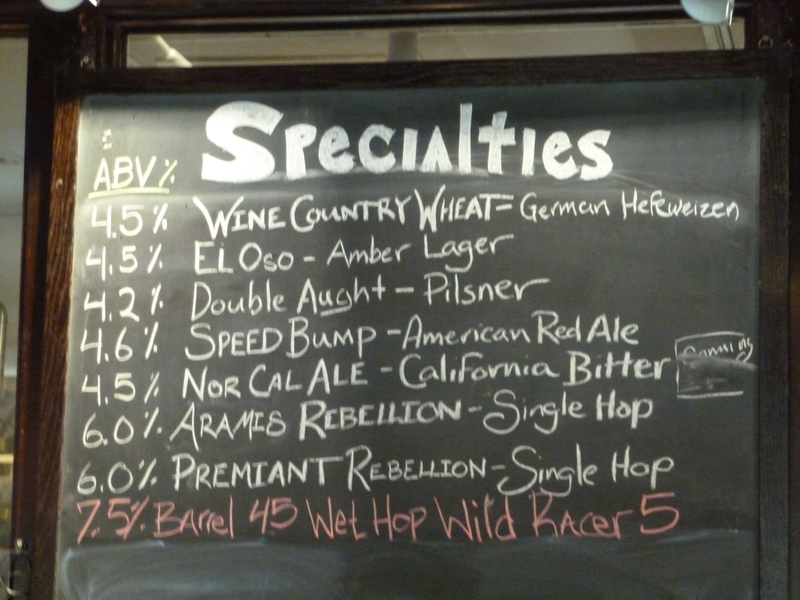 Their hard-hitting taster tray of specialty beers is not to be missed, and the Racer Five stands out as a California IPA hop bomb, also enjoyed in bottles from local stores. After Bear Republic, Healdsburg is a perfect town to stroll, enjoying the central plaza and picking your way through wine tasting rooms and fine restaurants will keep you more than busy. Just the aesthetics alone of Anderson Valley makes the hour and a half drive from Healdsburg to the Anderson Valley Brewing Company (AVBC) worth your time. AVBC’s large, airy tap room leads you to an outdoor beer garden. 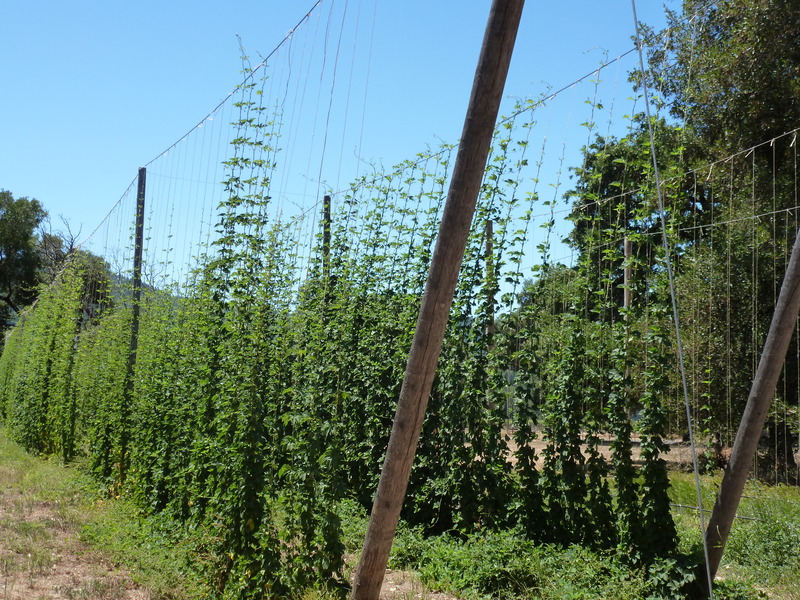 A short walk farther takes you to their hop field: the great brewery/winery crossover. There’s something quite special about walking through rows of grape vines at a vineyard, dancing amongst tall rows of hops is equally beautiful. Now head back inside for a massive list of beers. AVBC serves up delicious standards like their Oatmeal Stout (that I’ve been enjoying for years), and an array of high-alcohol and barrel-conditioned beers that will knock you off your stool with flavor and finesse. Plus, they have a great selection of bottles to take home. Out-of-State Adventures Explanation: We’ve been asked why we write about beer (and wine) from out-of-state on Colorado Brewery Days. It’s a good question. There’s certainly enough wonderful beer in Colorado, and even some new breweries now in the state that our summer travels have kept us from visiting. But I believe firmly that to learn about one subject (Colorado beer) you must study other subjects to compare and contrast. For instance, three years ago, Colorado IPAs often approached their hop-profiles with a little less punch than California IPAs. As California IPAs began dominating the market, some Colorado breweries started pushing the hop envelope. Colorado’s IPA innovations soon influenced other parts of the country. So what’s happening in the Colorado beer scene is directly effecting, and being effected by, beer from all over the country, (and the world). This entry was posted in Craft Beer Adventures, Out-of-State Adventures and tagged Anderson Valley Brewing, Bear Republic Brewing, Boonville, Craft Beer, Healdsburg, Paso Robles Area Wineries, San Diego County Breweries, Sonoma County Wineries. We’re glad you enjoyed yourselves in the Valley, and we look forward to visiting Colorado in October for GABF! Awesome. It really is quite beautiful out there . . . we hope to return. Best wishes at GABF!